With form around the likes of Verry Elleegant, it was not surprising that the promising Collectable was kept very safe when resuming at Sale on Sunday - the lightly raced three-year-old suited over 1400m at her first outing since contesting last spring's VRC Oaks. Getting too far back in a race run to suit the on-pacers that day, Collectable has been given time since, coming on nicely during the break - though we were by no means confident that she was a good thing! "She has been a little bit behind all preparation but we had to kick off as we want to get her to the Australasian Oaks," Robbie said. "We thought she'd be a little bit vulnerable and that if she won it would be purely on class... and obviously she is a class filly." Settling towards the rear, Collectable travelled sweetly for Matthew Allen who got her into clear running out wide in the straight - and from there she was able to gather in her rivals, impressive late racing clear to a soft 3/4 length victory. "I was tempted to give her a kick and go forward," Allen reported, "but knowing where she is going I did not want to over-rev her first up. So I rode her quietly and she settled really well." "When I clicked her up at the corner she really quickened up and when we straightened she was actually going to get there too early so I had to sit and wait a bit longer." "She got a bit lost when she got to the front, wanting to drift in a bit," he added. "She will really improved fitness wise from that and she can go onto better things, she has got a good future." "There is certainly room for improvement," Robbie agreed, noting that "it was a good ride and everything worked out really well." "We will head to a mile at Caulfield in three weeks and then it is two weeks into the Australasian Oaks." "She ran so well in the Ethereal Stakes in the spring (fourth behind Verry Elleegant and Aristia) so she has the right form lines to have a crack at a big race." 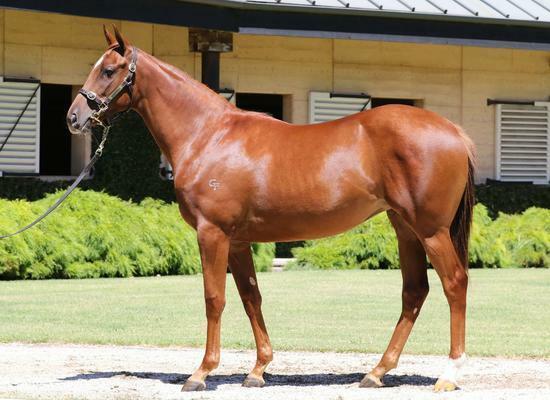 A striking chestnut daughter of the late Sebring bred by The Quarterback's breeder Gilgai Farm, Collectable caught the eye at the 2017 Inglis Melbourne Premier. She is out of the Queensland Oaks winner Miss Keepsake from one of Australasia's favourite families, that which has also produced the big race winners Lonhro, Grosvenor, Niello, Mahaya, Lankan Rupee, Tavago and National Gallery.